The SEDAN version retains all the features of the Swift Trawler 34, bringing very different functionalities to the Fly: a space for storing the dingh or any other equipment taking up a lot of room (bicycles, surf boards, etc.) This space can also be converted into a magnificent “king size” sunbath! The Swift Trawler 34 Sedan has the same type of semi-planing hull as its larger siblings, the ST 52 and ST 42. This hull design is the result of collaboration between the design group Joubert - Nivelt and the BENETEAU Design Office powerboat research department. The Swift Trawler 34 Sedan profile is simple and appealing – on-board living for a couple with their guests. 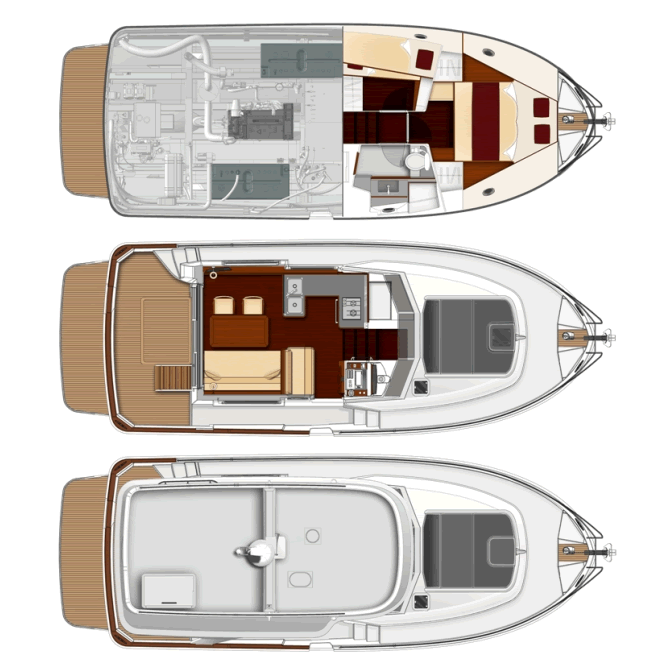 The Swift Trawler 34 SEDAN retains the general aesthetic feel of its sibling, with a well-defined wheelhouse style. In the cockpit, a large locker provides ample space to store everything necessary for sailing. Access to the transom skirt with its bathing ladder is gained via a pivoting door. Access to the large sunbathing platform forward of the wheelhouse is provided either by using the starboard passageway (with its gangway door), or along the very safe side-deck to port. Access to the wheelhouse interior is provided by a triple sliding door, which gives a real feeling of space. On the starboard side, the saloon converts very easily into a double berth (with a clic-clac type sofa bed, 1.20 m x 2.00 m). Forward to starboard the driving position with its double bench seat is very comfortable. The U-shaped galley is positioned on the port side and has a double sink and generous-sized work surfaces. Past the companionway on the port side is the ″guest” cabin (with bunk beds) and to starboard is the head compartment with shower and WC. Right forward is the large owner’s cabin with its wide bed (1.99 m x 1.60 m) and multiple storage lockers (one of which is located underneath the berth). The whole space is well ventilated with hull ports and deck hatches. Some major work has been carried out in order to improve the sound insulation on board the boat. The Swift Trawler 34 S is very spacious with a saloon, a galley and an owner’s cabin comparable to those on a 42- foot boat. The whole boat benefits from high quality finishes and woodwork. The Swift Trawler 34 S is single-engined with a Cummins 425 HP engine, guaranteeing a top speed of 19 to 21 knots, ensuring both safety and high performance (lower fuel consumption). A further version is available with a Cummins 330 HP engine, giving a top speed of 15 to 17 knots. The hull is very stable both at anchor and while at sea. Harbour manoeuvres are assisted by the bow thruster (standard) and stern thruster (optional).